The United States is considering intensified naval patrols in the South China Sea in a bid to challenge China’s growing militarization of the waterway, actions that could further raise the stakes in one of the world’s most volatile areas. The Pentagon is weighing a more assertive program of so-called freedom-of-navigation operations close to Chinese installations on disputed reefs, two U.S. officials and Western and Asian diplomats close to discussions said. The officials declined to say how close they were to finalizing a decision. Such moves could involve longer patrols, ones involving larger numbers of ships or operations involving closer surveillance of Chinese facilities in the area, which now include electronic jamming equipment and advanced military radars. U.S. officials are also pushing international allies and partners to increase their own naval deployments through the vital trade route as China strengthens its military capabilities on both the Paracel and Spratly islands, the diplomats said, even if they stopped short of directly challenging Chinese holdings. “What we have seen in the last few weeks is just the start, significantly more is being planned,” said one Western diplomat, referring to a freedom of navigation patrol late last month that used two U.S. ships for the first time. The Pentagon does not comment on future operations but a spokesman, Lieutenant Colonel Christopher Logan, said “we will continue to work with our friends, partners, and allies to ensure a free and open Indo-Pacific”. A more assertive Pentagon approach already appears to have started. Reuters first reported the patrol last month in which two U.S. Navy warships sailed near South China Sea islands claimed by China, even as President Donald Trump sought Chinese cooperation on North Korea. 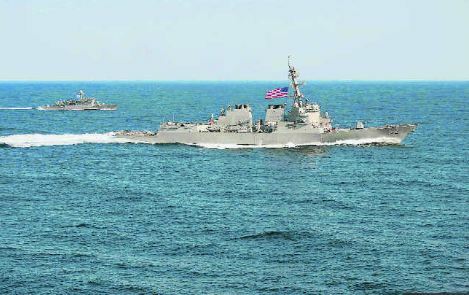 While the operation had been planned months in advance, and similar operations have become routine, it is believed to be the first time where two U.S. warships have been used for a freedom of navigation operation in the South China Sea. The Pentagon also withdrew an invitation for Chinese forces to join large multi-country exercises off Hawaii later in the year.